I shot over 12,000 photos on this trip and have only processed about 200 now. I could be at this for months! I figured I do a quick little recap with some photos…and more photos than usual because I have a broadband Internet connection again! Some of these images, you’ve already seen. It isn’t a trip for everyone, and whether this expedition speaks to you or not is an argument on to itself. Out of 21 days on vacation from work only 9 were actually spent on location. The rest were all days spent trying to get somewhere. South Georgia can only be visited by boat. There is nowhere to land a plane and it is too far to fly by helicopter and return. The Southern Ocean is the most treacherous and rough sea on the planet. Can you imagine being sea sick for days? If you’re someone who has to be around other people don’t take this trip. This is solitude like you’ve never experienced before. Solitude – it is amazing to truly find quiet on the ocean. Just the sounds of the wind and waves are very peaceful. No cars, no planes, no phones – just nature. You’ll meet interesting people who are either on permanent holiday or have a talent that lands them in exotic areas to share with others. South Georgia is the end of the world and to visit it is to have a memory of a place and prehistoric time that is shared with a minority of people (more people visit Antarctica itself than visit South Georgia). There are no land-based predators (like the Galapagos), so animals have little fear of humans on land. If you sit down and have patience animals will walk right up to you. Scenery, sounds, and smells cannot be mimicked. If a man has experiences the inexpressible, he is under no obligation to express it. Some folks could care less about other places of the world. Some folks think of a vacation as sitting by a pool with a drink in hand. Most folks cannot comprehend things they did not see with their own eyes, and I feel sorry for them. It is difficult to put South Georgia into words. It is still a memory that is as thick and wrapping as a parka. It is impossible to explain it in 5 minutes or less. I will be back there again. If I can’t visit it on my feet, then I want my ashes scattered on it when I die. If you want to talk about South Georgia, the Falklands, the Southern Ocean/Scotia Sea, Santiago, Ushuaia or anywhere else I was on this trip, I’m happy to answer direct questions. Salisbury Plain on South Georgia is one of the largest King Penguin colonies on the planet (about 200,000 nesting pairs) and is surrounded by 2 glaciers. This photo was shot when the sun just broke over the horizon and is a tiny part of the whole colony (the main part of the colony is to the right of this image). How are the kids? Did you see the size of that fish - yeah, look at your gut! "Skipping Ducks" as we named them during this trip. These are Gentoo Penguins porpoising to shore at Cooper Bay. 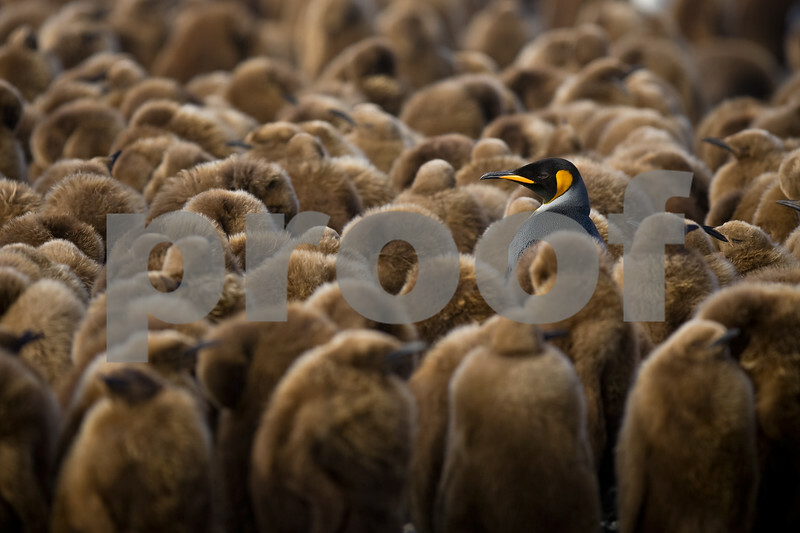 A group of King Penguins lined-up by the water trying to work up the courage to go in. These are some funny birds to watch because they are made for the sea, but they're so scared of actually going into it. 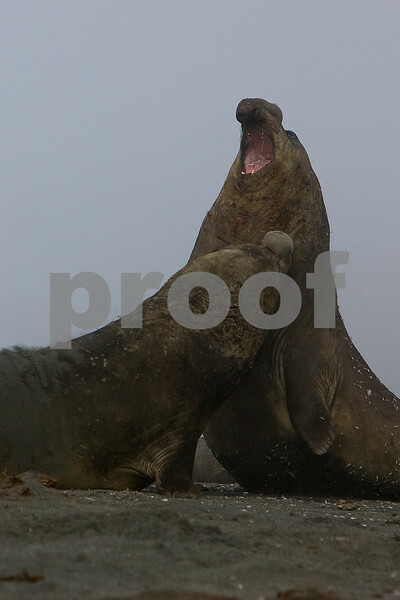 These guys were in Fortuna Bay and probably had Leopard Seals on the brain. Gentoo Penguin trying to walk over kelp at Prion Island. This is the "All in One" shot. We have Gentoo Penguins running in front of an iceberg, in front of the ship, with an albatross flying in front of the ship and elephant seals laying on the beach behind them. In the fog you can almost make out the base of some mountains. Makes me want a Pina Colada. My favorite penguin, the Rockhopper, has the most personality of all the animals I saw. I could spend days just watching these guys find mates, build nests, go to and from the sea, seek approval, show-boat, fight with their neighbors and everything else these little guys do. They're too funny! This guy was calling for a mate on Bleaker Island in the Falklands. I have better images of Fur Seals, but I like this big bull male just looking peaceful while basking in the sun at Prion Island. Get you own slew of women! Two different fights at Gold Harbor. 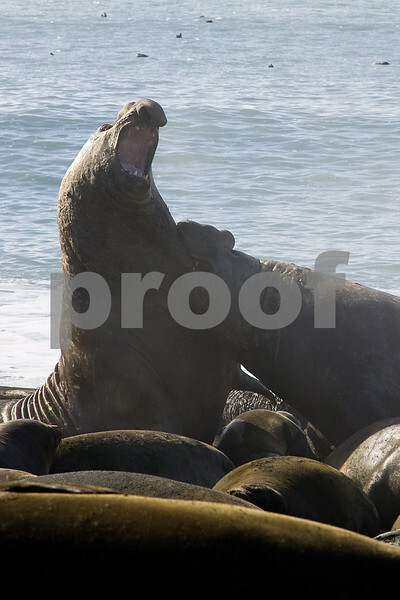 These Elephant Seals were everywhere on this beach. Every time you put your eye in your camera's viewfinder you were taking a big risk of being steam-rolled by one of these 4 ton beasts. If you couldn't keep both eyes going in 360 degree views one of these suckers could be flopping to steal a mate, flopping to fight the beachmaster for territorial control, or trying to run away from a whooping by the beachmaster. In the latter case, humans are just a speed bump. First glimpse of South Georgia rolling out of the fog and clouds. Light breaks through on a snowy morning at Stromness. Gray Headed Albatross at Elsehul. Light-Mantled Sooty Albatross over Prion Island in their mating flight. 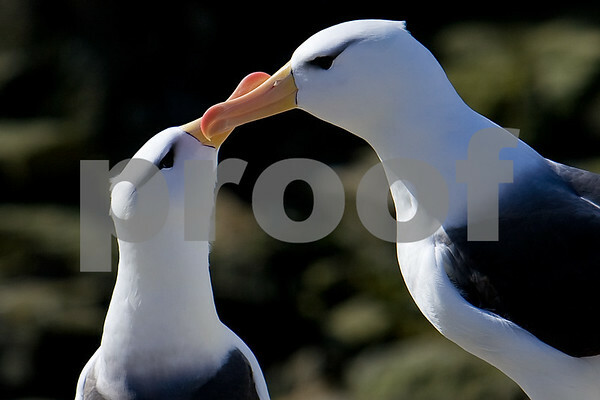 Black-browed Albatross showing some love on New Island in the Falklands. Skua taking a bath at Stromness. 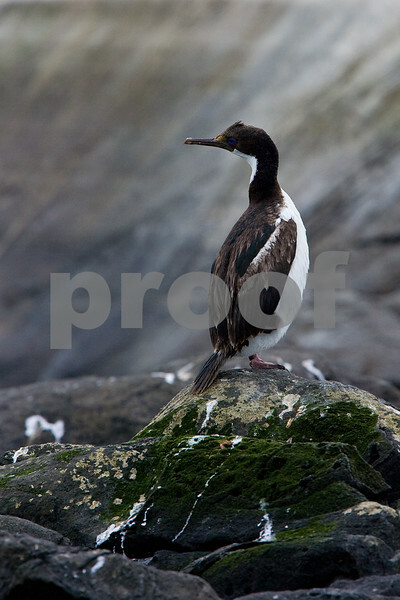 Blue-Eyed Shag looking for a mate in Ushuaia. He sure poops a lot! Some Sheath Bills stopped by the ship at Gold Harbor to see if I was dead because they were hungry. This is a nasty bird that I was determined to get a "cute" shot of. I actually have a few. The obligatory adult King amongst the chicks image. King Penguin chicks were named "Oakum Boys" by the early whalers and sealers because they looked like the young boys who filled cracks on ships with tar and horsehair. At the end of the day these young boys were covered in "fur'. More photos can be found at: http://axspot.com or click here to go directly to the “Race to Breed on South Georgia & the Falklands (early season Antarctica 2008)” gallery. Next Post Camera Gear – what worked, what didn’t? Wow sounds like a great trip and you’ve got your hands full with photos to edit. My favorite of the bunch is “Sunset in iceberg alley (between Cooper Bay and Drygalski Fjord)”. The color and composition are fantastic. I look forward to seeing more. What talent. I cannot begin to pick a favorite. I love them all. I am so glad you shared your trip with us. I truly enjoyed the adventure. I agree with Cathy…thanks! I feel like I was there…but not. I am sad to see the tweets die down. You should do an exhibit!!!! Ooooh do it! Do it! That would be great…and then Jeff and I can come down and meet up with everyone else who followed you and we can view your exhibit and have mexican and beer! That sounds like a very good plan if I do say so myself. That’s a helluva idea Erica! Your blogs and photos during your trip were a mini vacation for me as well. Thanks for sharing, I looked forward to each new post every day you were gone. You should post all your photos on Flickr.com to share with the world. Jody – thanks and glad you enjoyed it! Amazing ….thanks for sharing the link to the photos! Alexander my boy, you made my year. What an adventure of a lifetime. I lived vicariously through your adventure. Looked forward to each update, could not wait to see the new postings, and pictures. Thanks for taking us all with you, your talent isn’t only in the photo taking, but also in the journalism that accompanied the trip. We just got back from Punta Arenas. We were able to take a boat to see a colony of Magallenes penguins. It was fantastic. There were a bunch of babies and the parents had dug holes where they could hunker down and cuddle with the young ones. I’ll be posting some photos in the next week. We wanted to go to Ushuaia while down south, but unfortunately we got a bug and had to stay in Chile. Now we’re living in Santiago. Hope to see more adventures!